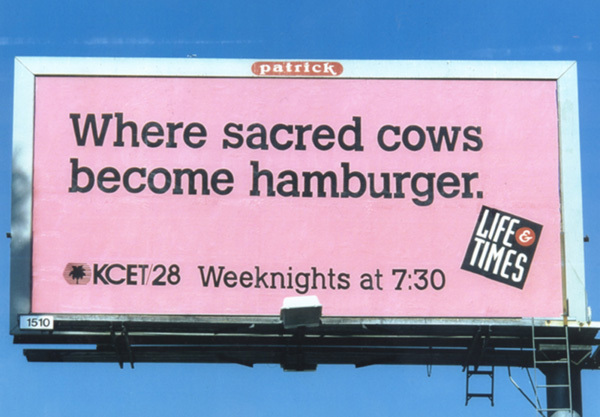 KCET, the public television station in Los Angeles, had a program called “Life & Times,” a half-hour public affairs series produced by KCET and hosted by Hugh Hewitt, Patt Morrison (“the lady in the hat”), John Ochoa, and Ruben Martinez. Providing widely divergent political viewpoints and philosophies, “Life & Times” took on all stories with an unflinching quest for truth. Nothing was off-limits. When Prime Chuck Creative was asked to create an inexpensive outdoor board, only a few words were needed. The show won 99 awards during its 15-year run. The billboard also won an award, naturally.